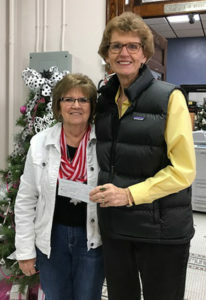 The Letcher Fire Department held their annual poker tournament on Saturday, Jan. 20. Winners are pictured, left to right: John Baysinger (high hand), Justin Enfield (third place), Steve Nelson (first place) and Toby Moody (second place). PICTURED ABOVE is the Sanborn Central Powerlifting Team that competed at O’ Gorman High School, back row, left to right: Aiden Wormstadt, Alex Wormstadt, Koby Larson, Coach Corey Flatten, Eric Ruml; front row: Weston Baysinger, Noah Wormstadt and Catherine Bechen. 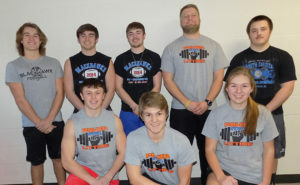 The Sanborn Central Powerlifting Team went to their first meet of the season last Saturday at Sioux Falls O’Gorman. Approximately 200 lifters from around the state participated in 16 different weight classes for high school boys and girls. Sanborn Central had seven participants. Lifters are given three opportunities to lift in each category (squat, bench and deadlift), with their max lift being recorded. The combined amount lifted between the three lifts gives the total and is used for placing in the boy’s division. Coefficient is the total amount lifted divided by the lifter’s weight and is used for placing in the girl’s division. …Read the results in this week’s issue of the Sanborn Weekly Journal! PICTURED, GAY Swenson, on behalf of the Woonsocket Community Club, donates $200 to Diane Larson, co-chairman of the Sanborn County Food Pantry.